While bitcoin dominated the headlines of 2017, many altcoins have far surpassed it in terms of gains against the US dollar. Furthermore, fees for transactions on the bitcoin network have increased to three or four dollars’ worth of coin a piece, sometimes more. Add to this the fact that the average person can hardly afford more than a few hundredths of a bitcoin or less, and it’s not difficult to see why altcoins have had the most spectacular year ever. Not all altcoins are created equal. Some have received little to no mainstream press coverage. Most of these coins have promising potential based not only on their technical performance vs fiat in 2017 (three out of the five have increased over 100 fold in under twelve months) but the way they have utilized blockchain technology. The following are my top five altcoin picks for 2018. The blockchain, in this case, becomes a decentralized marketplace whereby hosts compete with each other to win the business of those looking to store data. This drives the cost of using it down to rock-bottom prices. Those who rent storage space pay the hosts in Siacoin, a mineable coin that can also be traded on exchanges. In short, Siacoin allows for a more private, more secure, cheaper version of today’s cloud storage services. 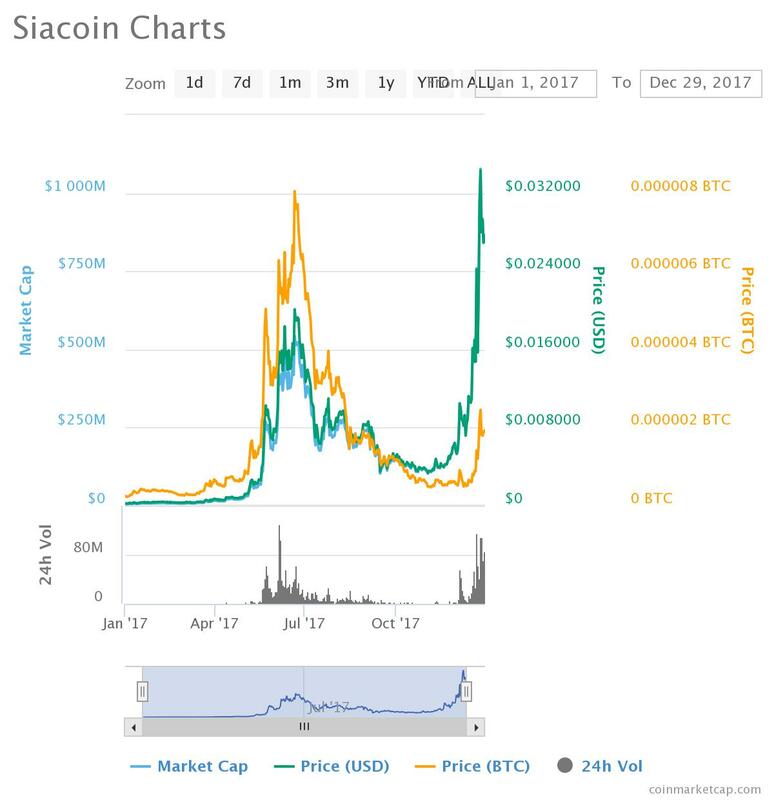 And the Siacoin token has done quite well. Bitshares also has an innovative and unique blockchain. Bitshares has its own digital asset exchange built-in. While the decentralized exchange has been the hallmark feature of Bitshares, it also has a host of other new ground-breaking technologies being implemented on its blockchain. 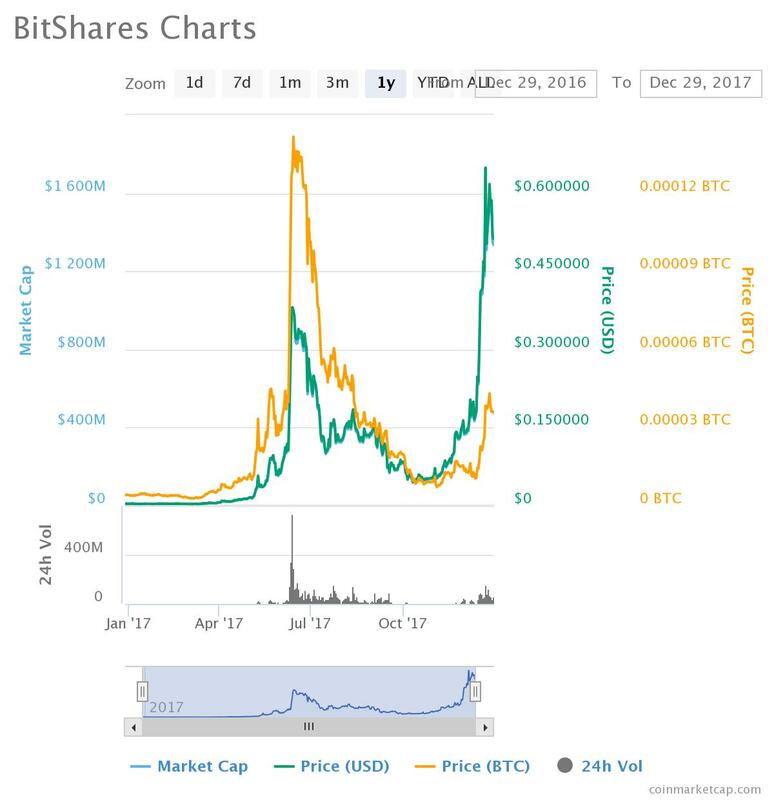 Bitshares began 2017 around half a penny. Today it approaches $0.50. All coins that disguise users transactions have done well and will see higher volumes of both trades and transactions in the future. 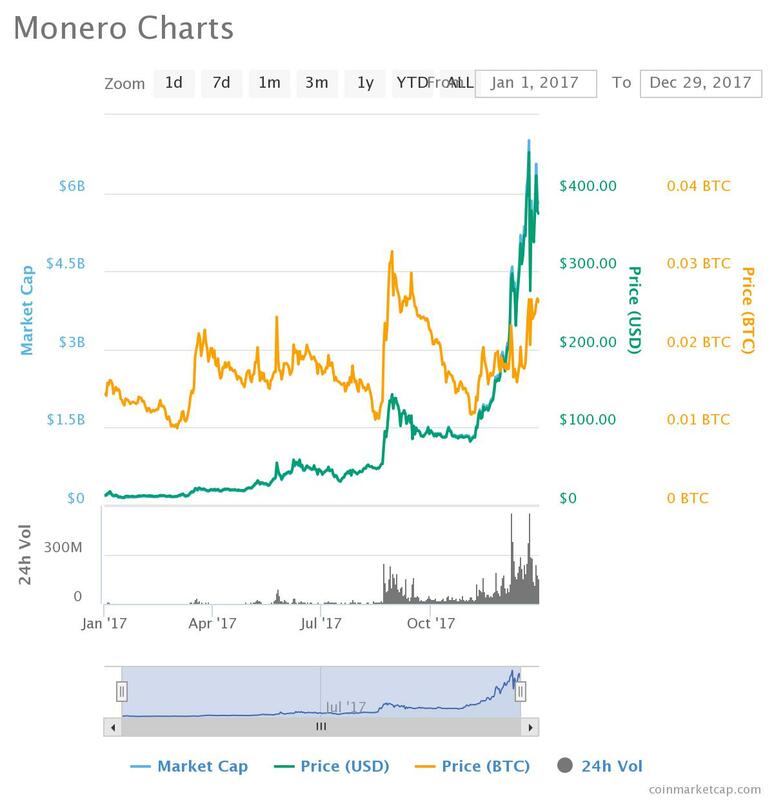 I chose Monero out of the bunch primarily for its performance vs. the US dollar this year. Ripple allows for almost instantaneous transactions with very low fees. It has performed very well against the US dollar this year. In early 2017, it passed a historic milestone when one XRP reached parity with one penny. In December 2017, one XRP reached parity with one dollar. And today it is approaching $2.00. I personally take issue with Ripple for many reasons. Many others feel the same – we’ll get to that in a moment. While XRP is a cryptocurrency, the Ripple blockchain is basically just a way for banks to move fiat faster. 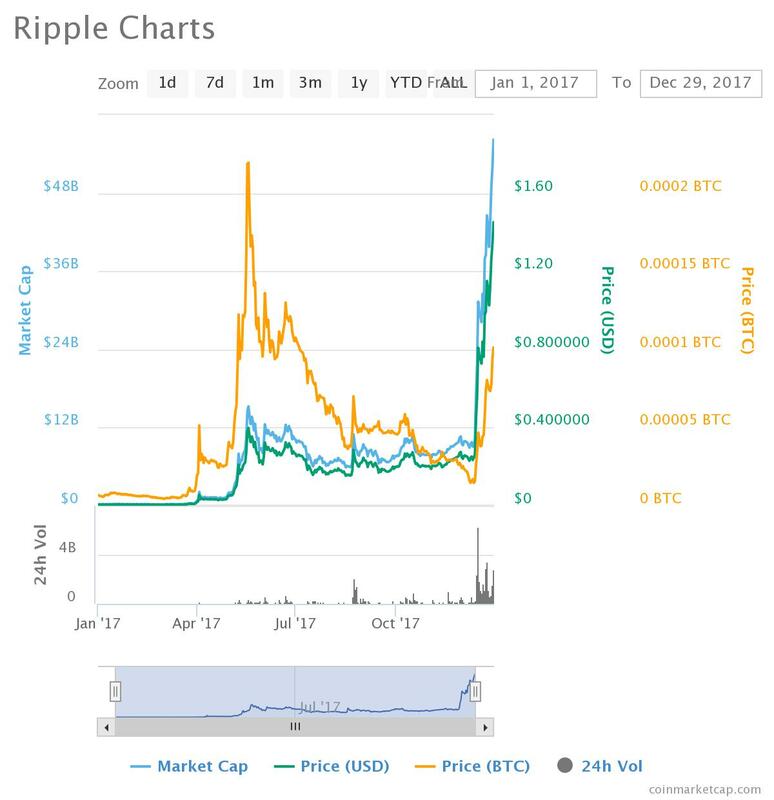 Still, XRP has been among the top ten cryptocurrencies by market cap consistently for years now. From a purely technical standpoint, one cannot deny XRP’s potential and past performance. My number one pick for 2018 is Vertcoin. 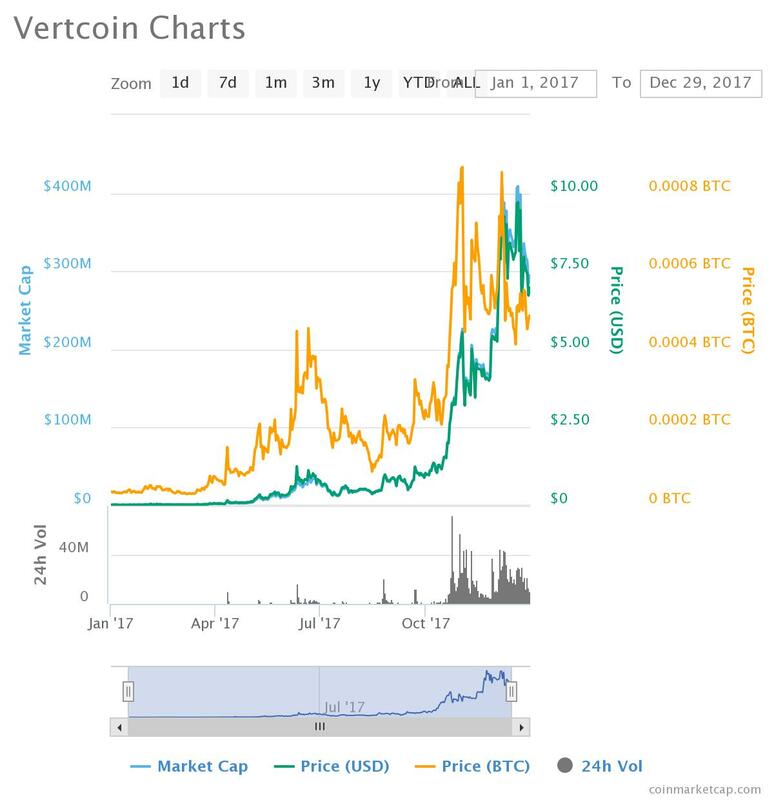 Vertcoin began 2017 at about $0.07. Today it sits at around $7.00. Vertcoin has a lot in common with Ripple. It also allows for fast transactions with low fees (fees can be as low as 0.001 VTC, about $0.007 today). However, Ripple has garnered a lot of controversy for being created by and for the very banking syndicate that the crypto community aims to make obsolete. In addition, Ripple is what’s known as a “pre-mined” coin, meaning a fixed supply was created the moment the coin was birthed into existence. Ripple’s creators decide when to release new coins and by how much. Not exactly the free, decentralized system that crypto was founded upon. Vertcoin is basically another bitcoin clone but with one key difference: it’s ASIC-resistant. That means anyone can mine it profitably, preventing larger mining pools from dominating the market and driving the price down by selling large quantities of newly minted coins. For more on Vertcoin, I recommend going to Vertcoin.org and beginning with the first two paragraphs on the homepage. All in all, there are too many promising altcoins to count. I’ve included these five for both their year-to-date performance and underlying tech. They have all performed exceptionally well in 2017 and will continue to do so for the foreseeable future, although they might first correct downwards in both fiat and BTC terms in early 2018. 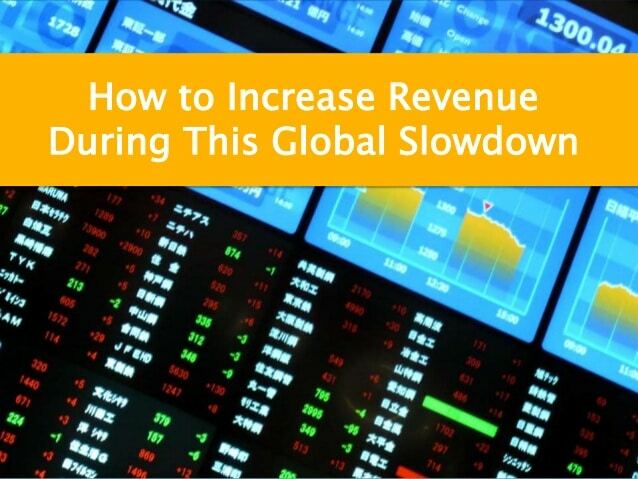 As bitcoin becomes too expensive for most people, it will become the slow gold of the crypto world. Cheaper, faster, and more interesting coins will inevitably take its place as the primary choice for everyday transactions. Siacoin and Bitshares have interesting and valuable technology built into their blockchains that has far-reaching implications that go beyond just the associated tokens. Monero allows for private transactions, making it more secure and allowing its users a greater degree of freedom from scrutiny. XRP allows for super-fast and super-cheap transactions. And Vertcoin, an ASIC-resistant mineable coin, serves similar purposes as Ripple while still staying true to the core concepts of crypto and making the individual their own bank. All of these coins have extra intrinsic value due to the special features of their blockchains. If you hold bitcoin, consider taking some of the profits you saw in 2017 and diversifying into other coins. Don’t speculate; do your own research and go with what you believe to be the most valuable. All of these picks assume that one will be holding them for the long-term. This new tech is not about making a quick buck. It’s about creating a new world based on blockchain that allows for greater innovation, freedom, and convenience than humans have ever known. Disclosure: These are the top picks of GSB contributor, Brian Nibley, and do not represent the top picks of Jason Hamlin or Gold Stock Bull. The author has a position in the coins mentioned in this article. To get all of our current cryptocurrency positions, top picks for 2018, ICO reviews/ratings and more, sign up here for just $99!